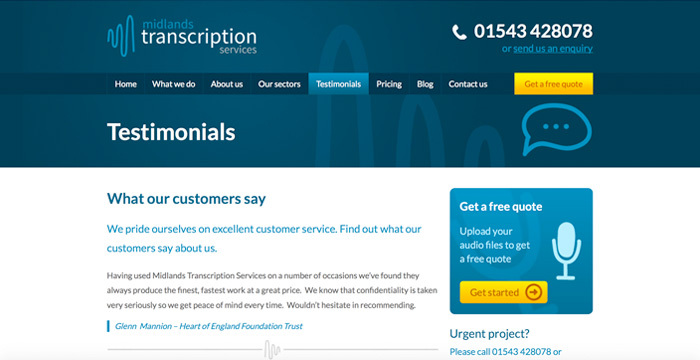 Midlands Transcription Services commissioned new branding and a website to sell their services and automate their quoting process. 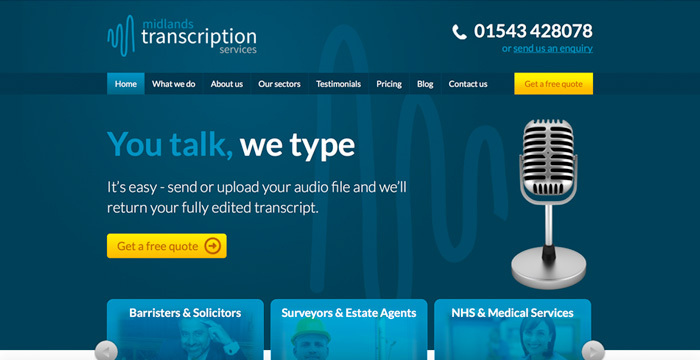 Midlands Transcription Services (MTS) offer audio typing for a range of sectors including the NHS, Police Interviews and Podcasts. Founded by Lesley Nash in 2012, MTS pride themselves on confidentiality, speed and accuracy, offering a friendly service along the way. The company was already well established but needed to step up their online presence to attract new business and compete in a growing marketplace. 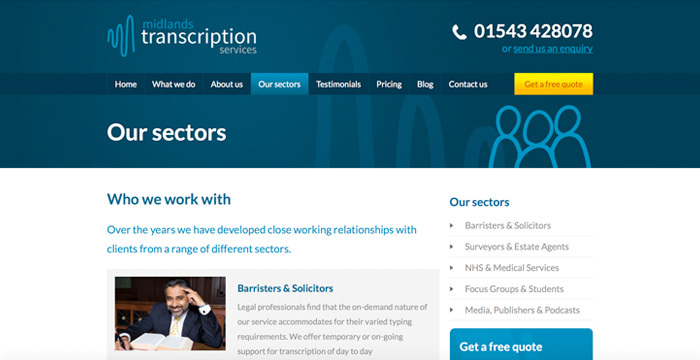 The West Midlands based company didn’t have a logo and their existing website was primitive and uninspiring. Lesley explains “It was very basic, old fashioned and studying the analytics, I noticed people were only staying on the site for short periods of time – it wasn’t inviting enough.” In order to upload large, sensitive audio files for MTS to work on, clients were forced into a long and complex process. Lesley contacted Refresh Studios when she realised the company had to do more to stand out from the crowd. We quickly identified the need for branding and a website that blew the competition out of the water. Refresh Studios then began the process of creating a bespoke website for MTS. From our conversations with Lesley, it was clear that the goal of the new website was to encourage people to upload their files and to provide a user friendly way of securely sending their audio files. We created a homepage which makes an great first impression. It features strong headline messages introducing the companies core service. The main sectors Lesley wanted to target are prominent allowing users to quickly relate to the business and get information tailored for their industry. The home page also highlights the easy three-step process for uploading files. The content on the MTS website is fully manageable from the intuitive content management system. Lesley is able to update anything from the main menu to the content and images on each page right from her web browser. Finally we created a bespoke system to allow clients to upload large audio files securely. They simply enter their contact details and upload a file. 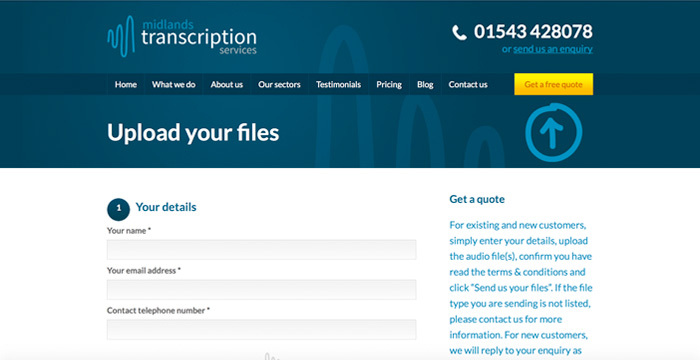 Midlands Transcription Services are notified when this happens and can then login to their secure administration system to download the file and mark the job as in-progress or complete.